Help students combine their knowledge of code to practice using maps. Ask students if they think they can find their house on a map. Use the Google Maps app to show on the class screen/board how you can input two addresses to get directions from one location to another. Invite students to use the app to find out the path they would need to take to get from their house to school. This allows students to practice writing their address. After everyone has had a turn, engage students in a discussion about what they discovered. Does everyone live the same distance from school? How do you know? Is there only one way to get from your house to the school? Could you give someone else directions to get from your house to the school? Does it matter whether you tell them the steps in order and if you are specific when you give the directions? Use the Google Maps website to create a map showing the driving directions (or walking if a student lives extremely close to school) from a students' home address to the school address. Take a screen shot of that map and then use a program like Photoshop to layer on a grid on top of the map. Print a map for each student. Collect enough Lego figures for every student, ideally a diverse group to represent each child. Make sure every child has a blue colored pencil or highlighter. Tell students that they have a chance to become computer programmers for the day! Tell them that they have been turned into robots (Lego figures) and they need to use their knowledge of coding to help their robots get from their house to school. The first thing students need to do is create a path for their robots to travel on as they go to school. Use a document camera to show the printout of a map enlarged on your board/screen. Show students how to create a path by coloring in boxes. Color in the boxes to help your robot have a path to get from home to school. Make sure to color in the entire box and remmber that robots can only travel inside boxes, not between them, so every box must be touching another! 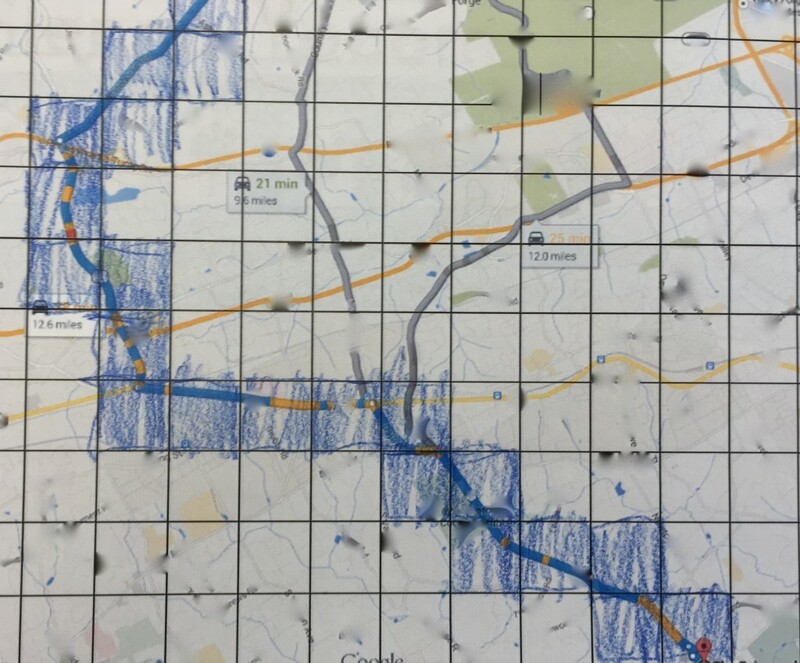 Once each student has correctly colored in a blue path for her or his Lego robot, laminate the maps. Use your document camera to display a completed map on the board. Discuss the connection between the codes up, down, left, and right that students have used in the Kodable app (shown as arrows) and cardinal directions (shown as N, S, E, and W). Draw them on the board and ask students to help connect the right ones together (i.e, N to Up). Invite students to help you write the codes that would help a Lego robot get from home to school using the example displayed on the board. Demonstrate how each blue square should have one letter, representing north, south, east, or west, depending on which way the "robot" should move. 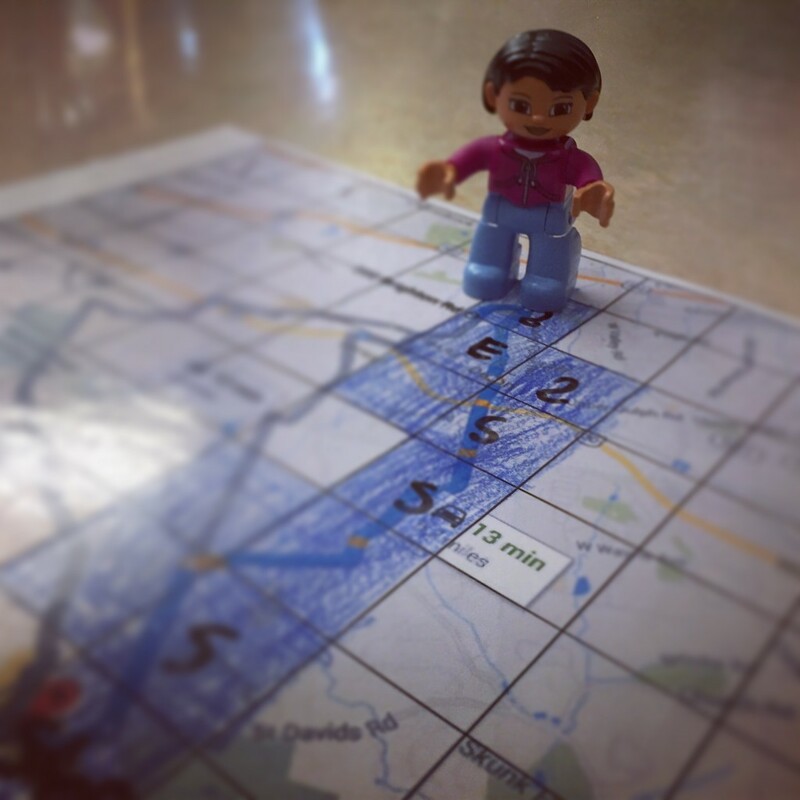 Hand out the students' laminated maps, one thin dry erase marker, and one Lego figure. Let students try to write the correct code to help their robot get to school on the map. Encourage them to erase their work and try again if it doesn't work and ask a friend if they get stuck. Use your dry erase marker to draw N, S, E, or W on your map depending on which way your robot needs to move to get to school. If you get stuck, just erase your map and try again. You can also ask a friend for help. Once students have successfully coded their robots from home to school, encourage them to trade maps with a peer and check the friends' work. Then trade with another friend, erase her or his map, and try to code it correctly. Next, have students trying writing out the code above the map or on a separate sheet of paper instead of inside the boxes. Again, students can try to code friends' robots using code that is written separately from the map. Another coding challenge can include using NW, NE, SE, SW in addition to the basic cardinal directions. Invite students to make a stop-motion video showing how their robot can get from home to school for further practice and review. Add in a voiceover or additional video clips at the beginning and end explaining how it the codes work, why the robot needs codes to move, and what students' learned doing the project. At the end of the project, students can take their maps home and use them as placemats for ongoing practice. Challenge them to teach their parents how to use the map and code it using cardinal directions!